Jane wrote letters daily, addressed to Ada, Ohio, where Roger was attending Law School some five hours away. And “Rog” as she affectionately called him, also posted daily to his love still at home. Each handwritten note featured a line from a James Taylor song penned at the top. As young loves with a charming family in their future, they sped the backroads of western Wisconsin in their MGB roadster painted British Racing Green – blasting “Steamroller,” Rog’s forever favorite. Life cruised along with a soundtrack of “You’ve Got a Friend,” “Something in the Way She Moves,” “How Sweet It Is (To Be Loved By You)” and other now-classics humming in the background. When Roger faced the unwinnable battle with Huntington Disease – which robs a person of physical and mental abilities during the prime of life – James Taylor crooned on; a sanctuary of joyous memories when the horrific disease physically stole Roger’s smile, but never his grace or dignity! Whenever Roger encountered discomfort or anxiety, the Rock ‘n Roll Hall of Famer’s music helped carry him through. After noting the power of James Taylor’s songs, Sarah, Roger’s RN Case Manager, had an idea. A pipe dream, really. She googled the singer and as if the universe’s “Smiling Face” was beaming down, he was scheduled to perform at Ravinia. She crafted an email, noting her patient didn’t have much time. Would he be available to meet a sick man whose life he’d been intimately part of, without even knowing? On a chilly summer afternoon, Roger sped down the highway one last time. This time in an ambulance, tucked into a hospital bed. As always, his sweetheart sat beside him. 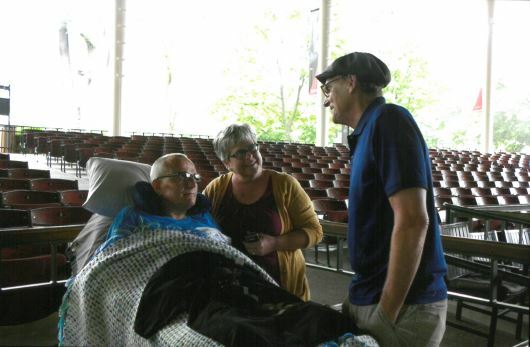 The couple arrived for sound check – a perfect- length private concert featuring the classics “Fire and Rain,” “County Road” and the most fitting, “Secret O’ Life.” Jane squeezed Rog’s hand as she sang along, with tears in her eyes and undoubtedly a broad smile on Roger’s heart. Your generosity enables Hospice Alliance to provide exceptional care for patients during their most difficult time of life – and to continue caring for families during the challenging days that follow their losses.